As sunny skies gave way to greyness and dampness, we all started to look for not just beauty but comfort in our clothes, so when I got an invitation to Les Foulards de Juju trunk show, I grabbed my umbrella and dashed out of the door with a wide smile on my face. Julie-Anne Dorff, an executive and jewellery editor of Harper’s Bazaar UK, might have an intimidating job title but in real life she is just a beautiful woman with an engaging smile who is following her own creative path. She clearly relishes an opportunity to express her own innate sense of style through the fabrics that she collects, in rare moments away from her day job and being a wife and a mother of three. The new collection from Les Foulards de Juju was inspired by femininity mixed with the boy meets girl undercurrents, as well as opulent jewels. When Julie-Anne showed me her moodboard, I realised that some of the images were already familiar to me from the pages of the magazines that we both enjoy reading, thus drawing me even closer to the stories behind the latest collection. the other slowly turning into a beautiful young lady, they created a mood board that was beautiful, yet in some ways understated. Mixing Prince of Wales checks, emerald greens, plaids, paisley, peacocks, a Liberty print and a beautiful purple floral fabric, the scarves, neckerchiefs and shawls encapsulate Julie-Anne’s own brief’ of ‘simple clothes, rich lines’ and somehow make me think of Spanish and Italian Ladies going out for dinner with scarves casually draped over their shoulders or tied around their necks or heads. You can choose a silk scarf or a warmer woollen shawl, ultimately there is a choice to suit any sensibility, as at the end of the day those scarves are meant to be worn daily, with casual insouciance and pleasure of its touch on your skin. There is something to be found in this collection for a stylish woman of any age, a dapper man or even a teen on the road of style discovery, not forgetting little girls as well. All of the scarves are made from the ‘end-of-the-line’ fabrics, so in essence you aren’t likely to see it on anyone else, which makes for a sense of uniqueness of purchase. In addition some scarves and shawls have smooth finished edges, while others have frayed ones. Personally I struggled to make the choice but walked away with something for myself to keep me warm in winter, stylish in spring or autumn and something that will cheer up my kids as well. As they say a happy mother makes for a happy household. 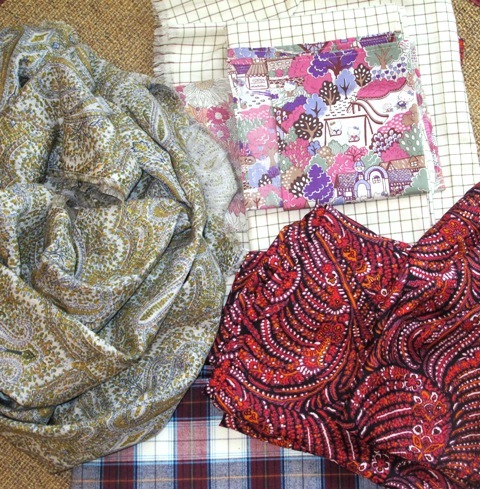 Les Foulards de Juju scarves are priced from £15 for a small children’s square to £40 for a large shawl or scarf.